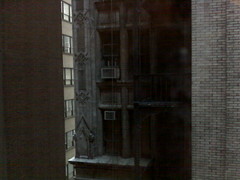 Just checked into my hotel in NYC and I am looking out at another tall building just yards outside my window. The lack of a good view - aside from illustrating the lack of "status" I have with this particular hotel - also means I am stuck in a brick canyon with no cellular signal. At all. So when I connected my Airport Express router to the hotel's free high speed dataport, I now have UMA and the coverage issue is gone.